Native Portals is a two-part movement performance series. An excerpt from the first part, titled Lynching & Love (2012), interprets first exposures to noose lynching as experienced by the artists in the work. The second part, titled Release Mourning Clearing, is a premiere. 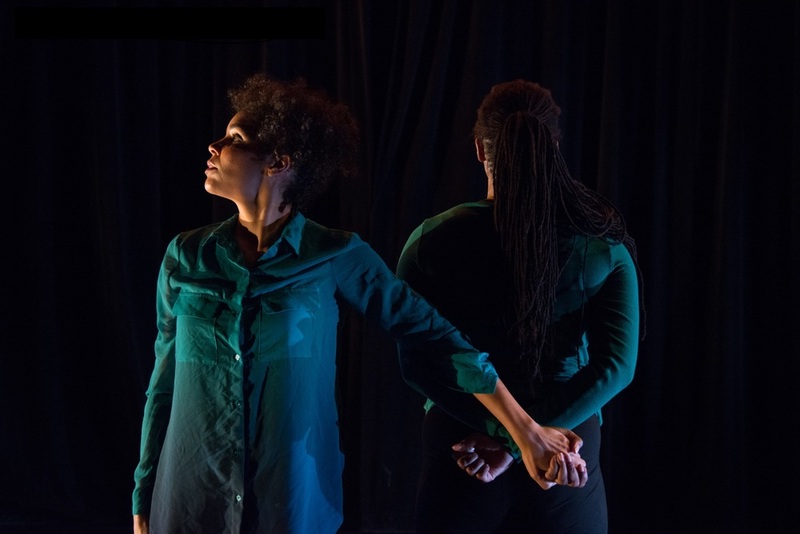 It conjures and translates, through dance, text, soundscapes, and live music, a tapestry of ritual practices rising from black diasporic experiences of activism, witnessing, reconciliation, and restoration. Please be advised this show contains socially and physically charged, intense language and gesture. Please bring children under 14 years of age at your own discretion. Performances will be followed by a discussion with the artists facilitated by Jamie J. Brunson, Executive Director of First Person Arts. Photo gallery: All photos by Johanna Austin, www.AustinArt.org. 1. Peaches Jones (sitting), Lela Aisha Jones. 2. (from left) Saroya Corbett, Oiya Lowe, Peaches Jones, Maritza Ogarro, and Deneane Richburg. 3. (from left) Peaches Jones and Oiya Lowe. Lela Aisha Jones is a native of Tallahassee, FL who resides in Philadelphia, PA. She is the founder of FlyGround, her creative home, where she cultivates her diasporic movement practice and artistry. Mostly an activist in her artistic practice and performance, she recently took her work to the streets as the lead centralizer/organizer for marches and social actions through Dancing for Justice Philadelphia in solidarity with the movement concerning Black lives. 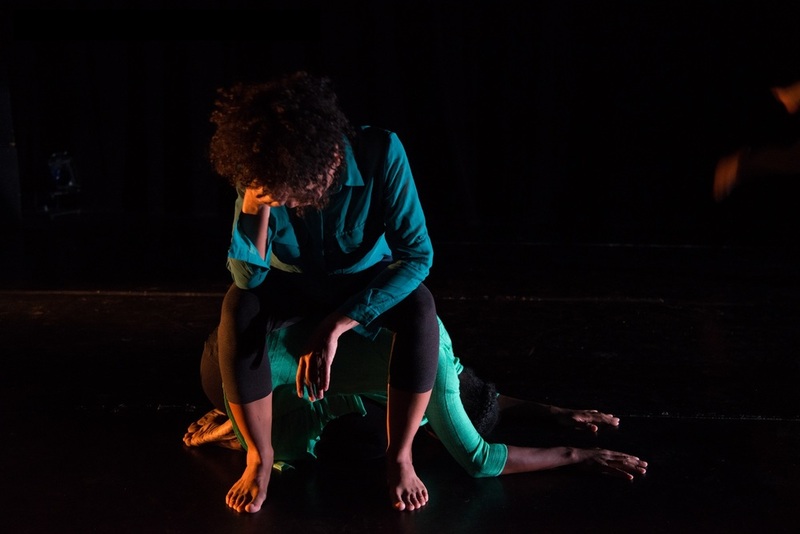 Lela is an Artist in Residence at the Community Education Center, a Headlong Dance Theater Incubated Artist, a 2013 Dance USA Philadelphia Rocky Awardee, a 2015 Leeway Foundation Transformation Awardee and a member of the inaugural 2015 Innovative Cultural Advocacy Fellows designed by leaders at the Caribbean Cultural Center African Diaspora Institute in NYC. Saroya Corbett is a certified Dunham Technique instructor and has a Masters in Fine Arts degree in dance from Temple University. In 2004, she graduated from Spelman College with a Bachelor of Arts in Economics. Her dance ability can be attributed to being trained under professionals like Katherine Dunham, Vanoye Aikens, Glory Van Scott, Walter Nicks, Tommy Gomez, Ruby Streate, and Kariamu Welsh. Throughout Saroya’s performing career, she has performed with Katherine Dunham Workshop dancers, CityDance Ensemble, and Kariamu & Company. Currently, Saroya is on the advisory board for Coalition of Diasporan Scholars Moving, an Adjunct Assistant Professor at Temple University, and the chair of the history/theory component of the Institute for Dunham Technique Certification’s teaching curriculum. She additionally is a company member of Flyground, a member of the Dancing for Justice Philadelphia collective, and the creator of Saroya Corbett Dance Projects. Amanda Edwards is from Mount Vernon, NY. She began her training at The Dance Theatre of Harlem, where she participated in the Community Program, Summer Programs, and the Pre-Professional Program. She attended Earl Mosely Institute of the Arts during the summers of 2013 and 2014. She is a recent graduate from The University of the Arts. She has worked with choreographers such as Iquail Shaheed, Jen McGinn, Olivier Tarpaga, Esther Baker-Tarpaga, Kim Bears-Bailey and Meredith Rainey. Amanda is currently a dancer with Dancespora, Putty Dance Project, and apprenticing with FlyGround. Peaches Jones is a movement artist specializing in dances and rhythms of the African Diaspora. She has been honored to move within the rhythmic heartbeat of the diasporic flow for over 20 years with amazing artists and teachers from Guinea, Senegal, Mali, Cuba, and Brazil. Peaches currently practices as a movement artist with FlyGround, a movement performance company founded by Lela Aisha Jones; and Kulu Mele, Philadelphia’s premier African dance ensemble. Peaches believes in the healing properties of diasporic rhythms and movement and is working to develop choreography and classes that cultivate physical, emotional, and spiritual attunement for individuals and community. Oiya Lowe (Detroit, MI) began training in dance during her more formative years at Martin Luther King High under the direction of Debra Kirkland. The desire to dance was ignited after witnessing the women of Alvin Ailey American Dance Theater (AAADT), women who looked like her, grace the stage and move the audience. Oiya later went on to graduate from Marygrove College where she received her BFA in Performing Arts. She has performed works by choreographers Waverly Lucas, Barbara Selinger, Pattie Obey, Sidra Bell, Ruth Leney-Midkiff, Anthony Levi, Saroya Corbett, and Kevin Iega Jeff. For five years, by way of movement Oiya has been able to tell part of her personal story and stories of those from the past by being an active member of FlyGround. Fans who’ve just discovered Keisha Hutchins’s smooth, heady blend of folk, soul, and alt-country might be forgiven if they are surprised to learn that the Philadelphia native didn’t learn her craft in a smoky barroom. Classically trained at the prestigious Oberlin Conservatory, Keisha has been exploring, blending, and bending genres from Carnegie Hall to the clubs of Philadelphia. In addition to her first group, the trip-hop electronic artists Vanishing Peoples of the Earth, the soprano has performed with the Philadelphia Singers, the former resident choir of the Philadelphia Orchestra, for seven seasons, and has collaborated with artists as diverse as hip-hop producer Justin Gilmore of KRU records, dance music producer and DJ MacGuyver, New York composer Andrew Shapiro, and New Orleans composer and trumpeter Hannibal Lokumbe. Her eclectic talents extend offstage: she is a music educator, serving as the Lower School Music Teacher at Abington Friends School and has received the Leeway Foundation’s Art and Change grant for women who use their art to create social change. Keisha’s debut solo album, Dedicated, moved the Philadelphia City Paper to name her one of its Great Unknown Artists in 2006. Her new album, Press Play, draws on a wide range of influences, creating a mesmerizing work that defies categorization. If you want to know what Keisha Hutchins is about—well, you’ll have to Press Play. Nasir Dickerson, BA, MA, youngest son of Mr. and Mrs. Robert H. Dickerson. Born in Philadelphia, PA, raised in Camden, NJ. Graduate of University of the Arts, with a Bachelor’s Degree in Saxophone Performance, 2006; and a Master’s Degree in Music Education, 2007. Nasir is a teacher of music at Creative Arts Morgan Village Academy in Camden, NJ. He received the Teacher of the Year award in 2010, Followed by, an Emmy Award in 2011, as part of a music teaching team who used a “Vertical Articulation” teaching method. Nasir is the leader of the jazz sextet, “Nasir Dickerson & The Renaissance Messengers,” and has produced two albums “Journey to Father Land” & “The Revealer.” He is also, an artistic/music director for “The Universal African Dance & Drum Ensemble.” In 2011, Nasir performed in the movie “WARRIOR” by LIONSGATE starring Nick Nolte. He has performed with rappers Beanie Sigel, State Property & Stalley at Jay-Z’s Made In America Festival in Philadelphia, PA. Nasir is also a World Champion 6th Degree Master Black Belt in the Martial Arts, and has been inducted into two Martial Arts Hall of Fames. Jeffrey Johnson has over 50 years of musical experience. He completed a BA in percussion and music education, and taught in the Philadelphia School District for 22 years. He is a percussion instructor for AMLA's Latin School of Music and is a freelance musician working in the tri-state area. Arielle Pina (visual artist) is from Boston, MA and is currently a Philly based artist. Her creative process is a self-exploration of an inherent knowing within her implicated body: an American, woman, patriotic, black body. She transposes her experience to highlight difference in an effort for it to be embraced, shared, and known. Her curiosity about where multiple art disciplines meet drives her to collaborate with other artists, making for multi-dimensional, textured creations. She received her Bachelor of Fine Arts from The University of the Arts, and received The Nadia Chilkousky Nahumck Award for Creativity and Dance-Making. She also attended the Headlong Performance Institute, a post baccalaureate in hybrid performance. Since graduating, she has shared her work at dance venues and film festivals in New York, Philadelphia, Boston, San Francisco, Belgium and Paris. Bonnie Mettler (visual artist) was born in Virginia but came to Philadelphia to study art at Moore College. Settling in Philadelphia, she has made a living as an artist and teacher of painting and drawing at studio schools since 1978. Currently, she is teaching at both Main Line and Wayne Art Centers. She works in oil, watercolor and acrylic as a realist painter. Her murals have been commissioned in private homes, businesses, and Mary Baldwin College. Her landscape and portrait commissions are in private collections. She has exhibited in many group and individual shows. As a member of Muse Gallery in Old City, Philadelphia, she is currently preparing an exhibit of paintings which will interact with the sculptures of her daughter, Ky Mettler. The June exhibit is entitled "Containers and Boundaries". 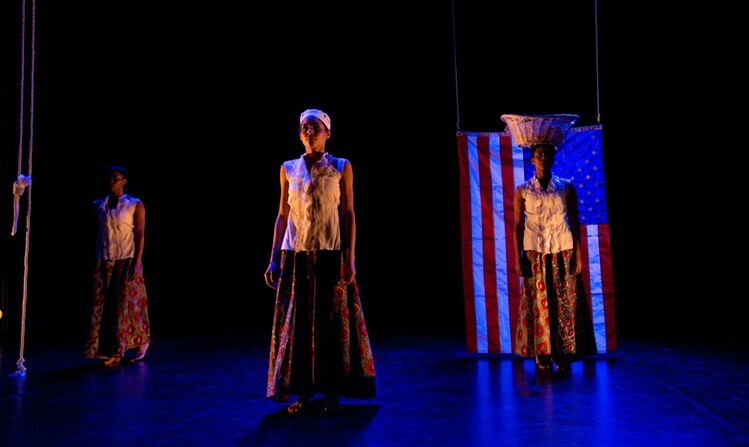 Join us before performances of Native Portals for a special installment of Food for Thought, our latest program combining a community potluck with informal discussion on relevant and compelling topics. On April 23 and 24, our theme will be "The Body Wails, The Body Restores," and our distinguished speakers Dr. Brenda Dixon-Gottschild (April 23) and Julie B. Johnson (April 24), will provide insight into how movement and the body are connected to artistry, resistance, and restoration. These installments of Food for Thought will be accompanied by two visual art exhibits: My Racial Ignorance by Bonnie Mettler and UNARMED evolved by Arielle Pina. This two-hour movement workshop will focus on the use of the body in activism, social justice, and cultural understanding. Attendance is free and open the public, including an interdisciplinary and intergenerational community of folks who consider themselves to be artists, activists, advocates, cultural workers, arts educators, teachers, and community organizers. This workshop is presented in connection with the premiere of Lela Aisha Jones | FlyGrounds’ Native Portals: Release Mourning Clearing. Participants can expect to experience movement and dialogue as mechanisms for processing charged subject matter and in the creation of performance-based activism. This workshop emerges from Lela’s continued work as Artistic Director of FlyGround, Co-Founder of The Requisite Movers, and Lead Centralizer/Organizer of Dancing for Justice Philadelphia. Please dress comfortably and for movement. This workshop is full. Please click the link below to join the waiting list. Please note that joining the waiting list is not a guarantee that additional space will open up.